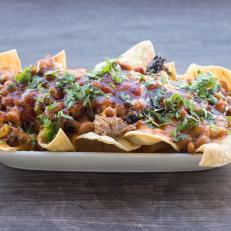 Angelenos head to a Holy Cow locale for the ‘cue-centric dishes, such as the Bull Nachos. Texas-inspired flavors come roaring through, thanks to a blend of smoked brisket, wet beans and gooey Cheddar cheese draped across crisp tortilla chips. A drenching of Holy Cow’s Q sauce lends a little sweetness to the mix.